Sure, you could get a sweet thrill from checking out the pretty patterns in a kaleidoscope. But it's much more delicious to taste the rainbow--delivered via crumbly, buttery, colorful Kaleidoscope Cookies. These cookies were a hit at Crafty Wonderland when Sara Bir served them to go along with Joe Ryckebosch's colorful tape art, and so I knew they'd be the perfect choice to serve at this past weekend's Urban Craft Uprising. Plus, they were from my BFF cookbook, Betty Crocker's Cooky Book . Yes! 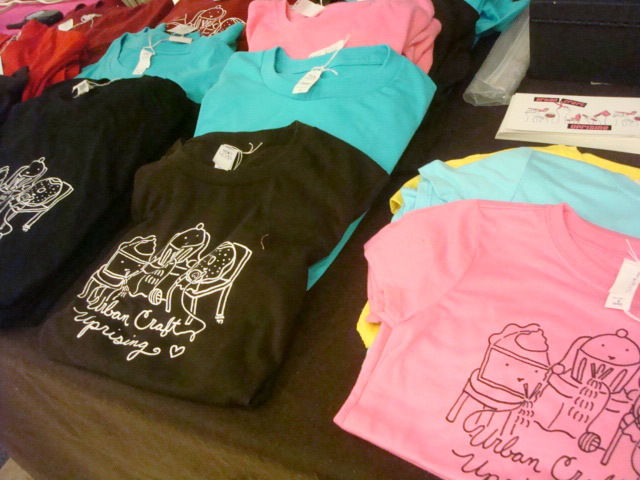 They were a nice echo to the colorful melange of t-shirts with my artwork, and the crowds--no pun intended--ate them up. I made a big batch--perfect for a big crowd. Here's the recipe. In an electric stand mixer, beat the butter with a paddle attachment until it is creamy. Add the confectioners' sugar and salt and beat for several minutes, until all of the ingredients are well incorporated and no lumps of powdered sugar remain. Beat in the vanilla extract, then add the flour and beat until a soft dough forms. Divide the dough into 3 parts. Incorporate the food coloring or gel of your choosing into each color--be sure to make the colors quite vibrant, as they will slightly fade in the oven (not much, but a little), and knead until the color is evenly distributed. 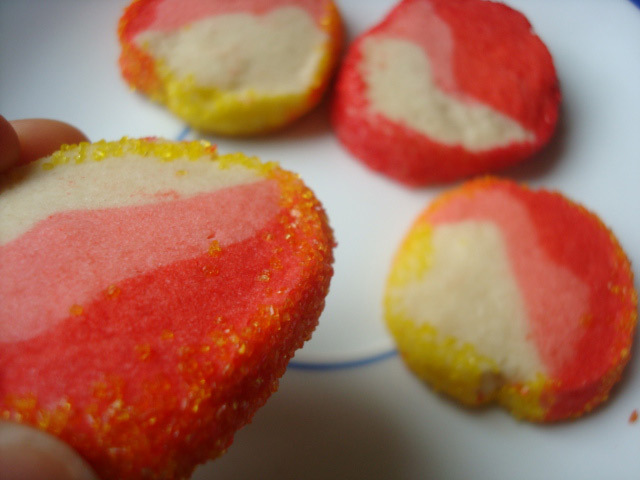 I left one part white, used a little red food coloring for a pink section, then more red for a red section for mine. Roll each tinted segment into a log about a foot long. Then squish the three logs into one long log and roll until they form one roll (I got a nice wavy design when I did this). Gently roll and squish the finished log until it’s about a foot long. Then cut it in half to form two logs and roll each one of those until you have a number of logs that are 1-1/2 to 2 inches in diameter--it will be quite a few. If desired, place the sprinkles or decorating sugar on a large, shallow plate and roll each log to coat. Wrap the logs in wax or parchment paper and chill overnight or freeze up to a month. Remove the dough from chilling--if it was in the freezer, let it warm up just until you can handle it, but not until it is soft Preheat oven to 375 F.
Unwrap the logs and, with a sharp knife, slice them into coins about 1/3-inch thick. Place on ungreased cookie sheets (the cookies will not spread much as they bake). Bake two sheets at a time for about 7-9 minutes, rotating halfway through baking, until the cookies have firmed up but are not browned. Remove the cookies to a wire rack to cool completely. Store in an airtight container.